Ryan and I make a really good team. I know this, I’ve always known this, but sometimes I forget. Please tell me I’m not the only person who tends to exaggerate their contribution to something while not fully recognizing another’s! So yes, there are times when I get caught up in me me ME and get these crazy thoughts in my head. Thoughts like “Why do I do EVERYTHING around the house ALL the time?” or “Why isn’t Ryan doing X,Y, Z? Doesn’t he know he needs to do X, Y, Z?” Now, anyone who knows Ryan and I as a couple realizes that these are pretty unfair thoughts. Most women would kill for a guy as willing to help around the house as he is…but like I said, I’m human. And therefore forgetful. Or just silly. I’m reminded just how helpful he is when he takes off to San Diego on business travel for work, as he does several times a year. Suddenly, I really AM the only one doing things around the house. I spent five days making the bed, watering the flowers, and driving myself to work, and then I’m reminded just how helpful Ryan is and just how much he does, often thanklessly and often only because I want it that way (guarantee he doesn’t make the bed when I’m out of town!). One other major way I am reminded of his absence is when it comes to food. Last time he was out of town, I made this pasta salad the day before he left. We each sampled a little bit that evening, and he ate some for lunch before he left, but then I found myself eating it for the next three days…and that was AFTER taking some to share with friends! Thankfully, this salad was good enough that I didn’t mind eating it for a few dinners. I adapted the original recipe, subbing zucchini for cucumber and adding a can of chickpeas for extra protein (this would also be good with some grilled chicken!). My only complaint was that it wasn’t heavily dressed for my taste—next time I’ll make 1.5x the batch of strawberry pesto, or stick to the solution I discovered this time around….drizzling some balsamic vinegar on my portion just before eating, which ended up being rather delightful! This meal is easy, fresh, and healthy…not to mention completely vegan, for any vegans out there! 1. In the bowl of a food processor, add basil leaves, olive oil, almonds, and lemon juice, pulsing until well combined. Add strawberries and pulse until smooth. Season generously with salt and pepper. 2. Prepare pasta according to package directions. Drain, allow to cool slightly, and place in a large bowl. 3. Add strawberries, zucchini, basil, spinach, almonds, and chickpeas. 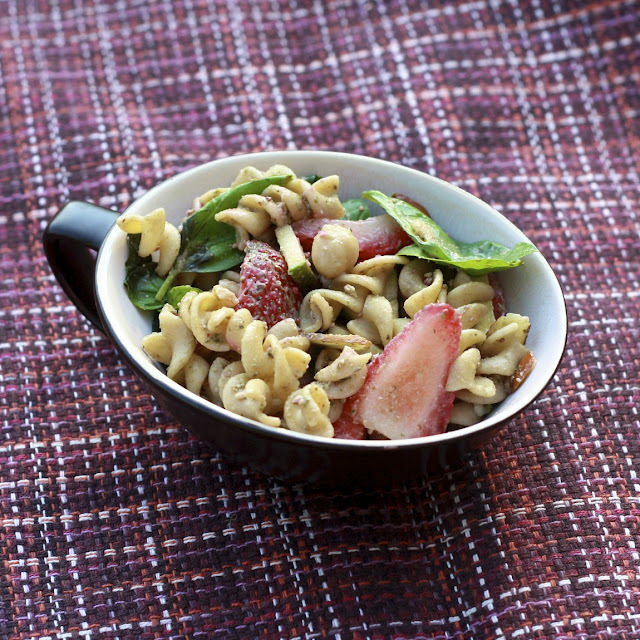 Toss with strawberry pesto. Season to taste with salt and pepper. 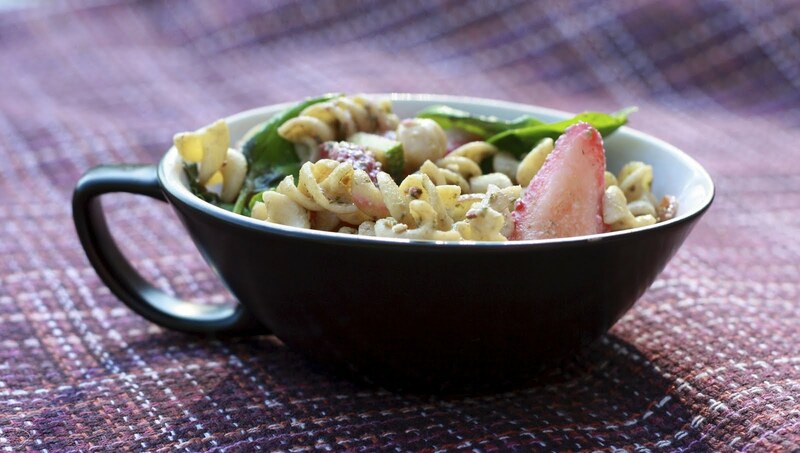 If desired, drizzle pasta salad with balsamic vinegar before serving.